After a triumphant return to the very roots of the modern RPG with Pillars of Eternity, Obsidian went to Kickstarter, as it had for the original, to finance a sequel, subtitled Deadfire. Currently moving into a closed beta for backers and the reviewing community alike, the sequel is shaping up to be everything great about the original, and then some. As closed betas are more often than not used to start ironing out technical issues, and the development team wants to avoid the full narrative getting out so early, the broader story is often left out of an early beta. 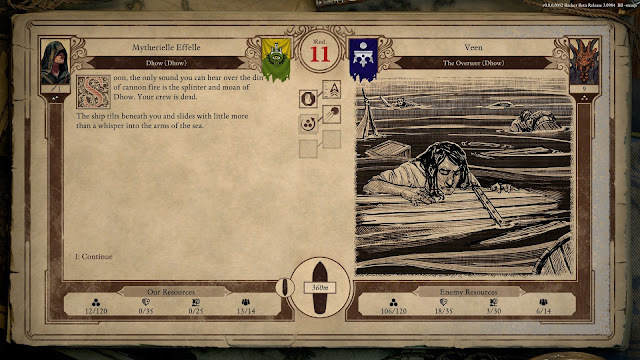 Deadfire is no different. While we've been able to get a fair few hours of play in, the reasons why you and your party are there is a bit of a mystery. The build drops you somewhere past the beginning of the game, so don't fear, there will be an abundance of narrative context by the time that you're playing the full game, but I just can't talk about it right now. Still, there is plenty to do with people to speak to and quests to take on, it's all very intriguing... especially since you are the captain of your own ship and it has cannons! The downside? You have to pay the people working for you - this time around they're not tagging along just for the heck of it. Fair warning, if you have a mild to severe case of choice paralysis… good luck. 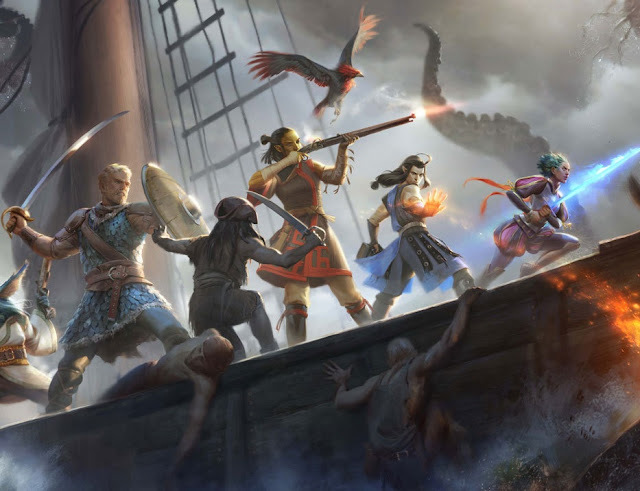 Pillars of Eternity 2: Deadfire plays host to a deep enough character creator allowing for you to really get into the nitty gritty of your character and how you plan to use them. For anyone who’s ever played a Dungeon & Dragons title you’ll feel right at home as the character creator is essentially filling out a character sheet with the player’s manual by your side. It is, of course, why people loved early RPGs like Baldur's Gate, and what Pillars of Eternity was built around, so it's good to see that this hasn't been meddled with in any detrimental way. So after landing on a dock with your custom character and your placeholder crew each named after their classes, what you do from there on out is up to you. Talk to the locals? Ignore the locals and leave town or simply 180 and get back on your ship and leave the island. It’s your choice! It’s probably better to explore the island and talk to the locals first because it won’t take long until your first encounter and you’ll want to start collecting experience and leveling up soon. Combat felt natural enough with a system that blends real time combat and turn based decision making, which will again be familiar to the genre veterans that this game has been explicitly built for. At any point you can pause the action to give each character orders, or you can simply let the action play without pausing and allow the AI to make the decisions about how a character will behave. 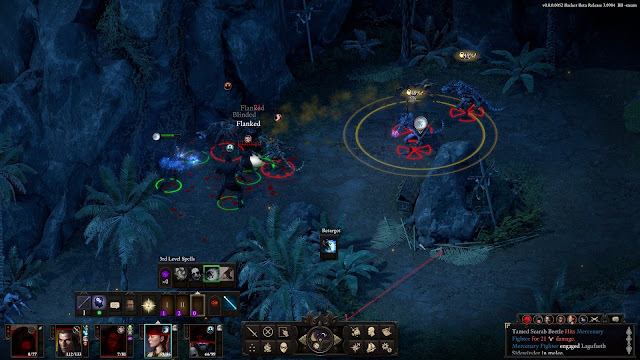 For all its storytelling, Pillars of Eternity was a very combat-focused title, and the polar opposite of last year's Tides of Numenera, despite both games sharing a similar top-down perspective on the action. Pillars of Eternity 2 is also very heavily weighted towards the combat, I can assure you. This one has naval combat, and it's already brilliant. Instead of visually representing the characters running around or the ships floating in the water with gunpowder smoke everywhere, these battles take place on paper, as though you're reading a book. On the "page", you'll see options allowing you to manoeuvre your boat relative to the enemy ships, bring your cannons to fire on it, and so on. All the statistics that you need to make good decisions; your ship's health, the distance to the enemy ship, and so on, are presented there on the "page" for easy reference as the battles play out. It's a strategic and fundamentally interesting way to represent ship-to-ship combat, and turns it into a deep part of the storytelling experience. Unsurprisingly, already there are so many different ways to resolve many of the encounters of Pillars of Eternity 2... just as there was with the original, and the games that inspired it. Do you talk your way out of trouble, or bypass trouble entirely by keeping to the shadows? The game does seem to want to reward non-violent confrontation, as talking your way through problems will generally yield the better rewards. From what I’ve been able to experience so far, Pillars of Eternity 2: Deadfire is going to be almost exactly like its predecessor (with extra boat battles) and that means it's going to be brilliant. I am happy that Obsidian have returned to its Black Isle roots and that they are continuing on providing us new and amazing spiritual sequels to the stuff it used to work on back when Baldur's Gate, Icewind Dale and Planescape Torment were all fantasy RPG fans could think of.